In Amsterdam, the best way to view the majestic fall leaves is from the comfort of a canal cruise. Around this time every year, the falling autumn leaves create a splendid display throughout the Cities of Europe. It’s not only a visually stunning time to visit Europe, but also considerably less crowded due to the changing tourist season. Enjoy the charm and excitement of the fall season in Europe, and consider exploring one of our favorite autumnal cities! When in Rome, eat as the Romans do! The Italian fall harvest is a foodie’s dream, and Rome is the perfect place to enjoy many seasonal dishes. Between bites of pasta and sips of wine, explore the city at its most agreeable temperature. Not only will you have beaten the summer heat, but you’ll have more space to view the Colosseum and the Pantheon with fewer tourists around. 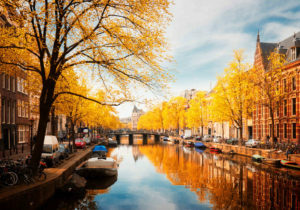 In Amsterdam, the best way to view the majestic fall leaves is from the comfort of a canal cruise. With thousands of trees surrounding the canal bands, the capital of the Netherlands is the perfect autumn destination. Explore the natural beauty of the city during the day, then experience Amsterdam’s thriving nightlife during the Amsterdam Dance Event (every October). Recover the next morning with a slice of apple pie and a warm glass of sipping chocolate. Are you planning your visit in November? Experience the art world of Amsterdam at Museum Night, where attendees will have access to 50 museums until 2 am! This entry was posted on Wednesday, October 3rd, 2018	at 10:17 am	. You can follow any responses to this entry through the RSS 2.0	feed. You can leave a response, or trackback from your own site.